This is what happens when Urban Fantasy and Traditional Fantasy collide.Results :Epic.Beautiful.Tragic.Captivating.After finishing this book, I am in awe of this woman's writing skills. For as much as I love books from any fantasy sub-genre, I also have my own personal roadblocks. Very rarely, can an author use as much descriptiveness in a book without me wanting to tear my hair out. Often, writers show off their "words" just for the sake of trying to impress us. 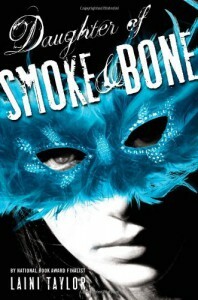 I never felt like this was the case with Daughter of Smoke and Bone. Every single word had a purpose. Every single word connected one part of the story to another part of the story. Few authors have the gift to interweave fantasy worlds like this one has accomplished, almost seamlessly. From the opening scene where Karou had to sketch her ex-boyfriend naked in front on an entire classroom, to the middle scenes where Karou takes flight, to the ending where clues from the beginning of the book finally started to unravel (the revelation of the book's title was brilliant)...it was one incredible journey.Even the small details were treasures waiting to be found - Teeth. Scuppies. Pain. Horns. Hooves. Hybrids. Enemies. Lovers. Portals. Death. Birth. Betrayal. Hope. A wishbone charm.Because I read this book over the holiday season, I was unable to sit down and read through it in a short period of time. For most books, this would be the kiss of death. Details are often lost when you can't keep them fresh in your mind. Never once did I have trouble picking the book back up after putting it down for a day or two. Every time I came back to Daughter, I did so with an inner excitement, knowing that something good was coming.Karou, Akiva, Madrigal, Kaz, Brimstone, Issa...so many fascinating characters sprung up from the pages. I really hope we get to learn more about Kaz in the future. I missed that storyline in the second half of the bookThere were no complaints from me about the supposed "genre shift" at the midway point. I kept waiting for one to happen and it never really did for me. The story's focus did shift as the past was brought to the forefront, but many of the early story details were answered in the end, bringing the book full circle. There was more of a "fantasy" focus to start, then the romance crept in midway, becoming a very heavy presence, but the fantasy aspect never died imo. If anything, the world building twisted in and out among itself, pulling in more and more details about the lives and lands of the seraph and the chimera.I am completely thrilled that this book will become a series. The ending left me wanting for more.